The city of Kingston had its origin in the aftermath of the 1692 earthquake which destroyed Port Royal, many of whose inhabitants moved to the newly established settlement across the harbour. Over three centuries Kingston itself has suffered many hardships caused by hurricanes, earthquakes, epidemics and fires. 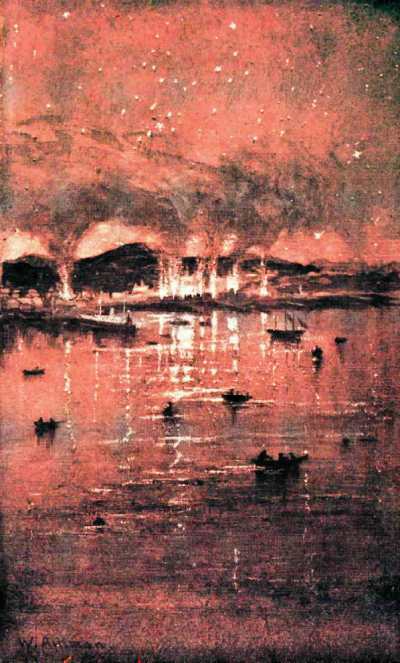 This page looks briefly at the major fires which devastated the city, at a time when virtually all its citizens, of all colours and classes, lived closely together below North Street. 1862 'Fisher's Fire' in Kingston; the Fire of 1862 became known as 'Fisher’s Fire' having started in Fisher’s Bakery on Harbour Street.
. . . when the people in the vicinity were at last aware of their awful danger, the entire Foundry premises was al­ready almost consumed, the shingled roof being one mass of flames, spreading in a few minutes to neighbouring wooden buildings housing a saw mill and steam bakery . 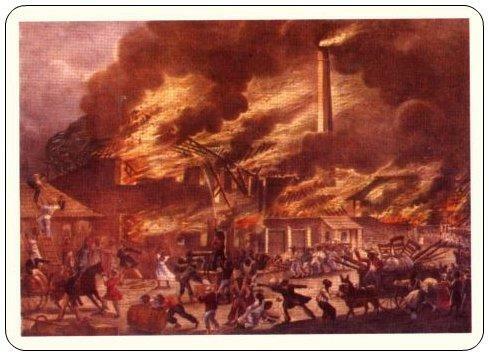 . .
- the Fire of 1862 was to become known as 'Fisher’s Fire' having started in Fisher’s Bakery on Harbour Street. The fire of 1907 was a direct result of the Earthquake on January 14th.